I developed an affinity for a particular ramen shop in Shinjuku; a type that is quite difficult to find elsewhere - tomato ramen. 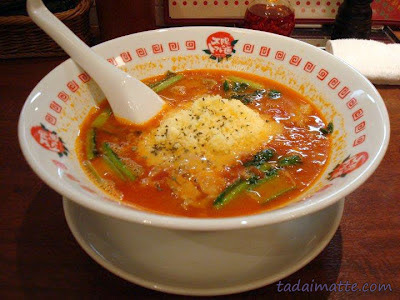 You may have heard of tomato nabe, but ramen is a much rarer thing. The restaurant in question is called Taiyou no Tomato Men (Men meaning 'noodles'), and it's located on the food court floor of the Mylord building in Shinjuku, part of Shinjuku Station. After just one taste I knew I had to recreate this at home, lest I leave Tokyo and never be able to eat it again. Well, as it turned out, it's a small chain and they have an Osaka location - in fact, a huge number of shops have opened since then! 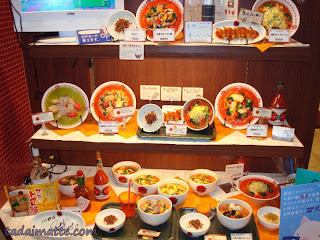 - but I still returned to Shinjuku with my friend Gen-chan to get her help in figuring out the ingredients (and also to hook another person on Taiyou no Tomato, natch). 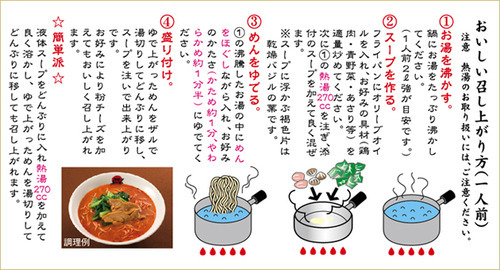 Between the two of us and the Taiyou website for some ingredient tips, we came up with the following easy recipe that you can use to make your own tomato ramen at home! Sautee garlic, tomatoes and spinach in olive oil. Add the stock, chicken and greens, then seasonings, and simmer for 20 minutes. If you prefer your soup a little thinner, add more chicken stock or water. Cook the noodles in a separate pot and serve into 4 bowls. Add soup, then cheese on top and allow cheese to melt into the soup. Eat with chopsticks and a ramen spoon if available. If there are leftovers, you can use the soup stock, cheese and some bread crumbs over rice in a buttered dish, and bake it for a delicious rice casserole! Tried this today. A little bland, but not awful.